As the days grow a little shorter, the arts are shining brightly in Stevens Point. 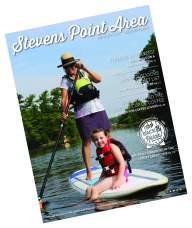 There are a number of arts-related events happening in the Stevens Point Area in coming weeks that you won’t want to miss. The Edna Carlsten Art Gallery on the UW-Stevens Point campus is hosting a photography exhibit, Capitulos. Guillermo Peñafiel is a native of Lota, Chile and a professor of photography at UW-Stevens Point. The exhibit runs through Oct. 25. Ink in Grooves…Or Not is a printmaking invitational at the Q Gallery Artists Cooperative. The exhibit showcases the work of a talented group of printmakers and features a variety of printmaking techniques. The exhibit runs through Oct. 30. The Central Wisconsin Children’s Museum features a variety of fun weekly arts programs for kids. The museum is also sponsoring a Healthy Halloween Hoedown on Oct. 30. The Portage County Library on Oct. 16 will feature a presentation of stories and images featured in Birds in Art, an exhibit at the Leigh Woodson Art Museum. The Fall Collage Concert will take place Oct. 16 at the UW-Stevens Point Noel Fine Arts Center. The performance features three choirs.